Welcoming 2 bedroom holiday home to sleep 6. Ideally located near Courchevel, Alps. This wonderful holiday home has access to a brilliant shared pool area that the kids will love! Restaurant nearby. This self-catering apartment is located in Plagne Villages, and is just 300m from the shops and a short cable car ride from Plagne. 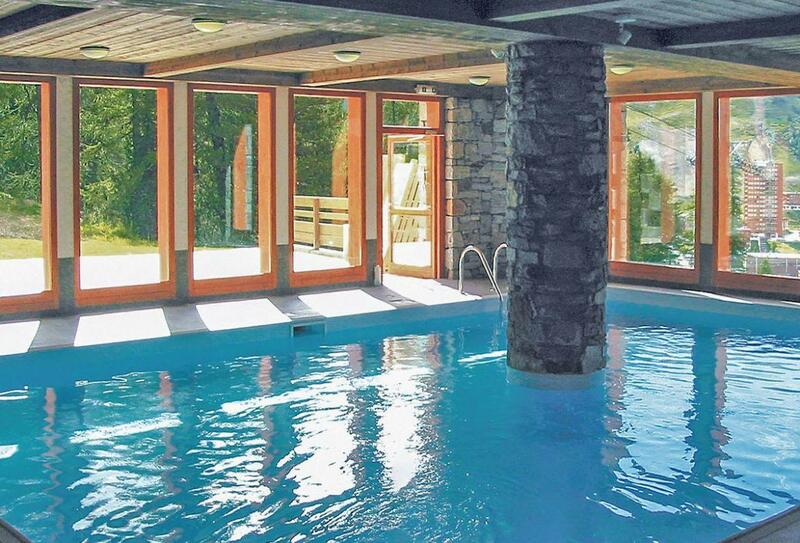 The complex, which has a shared indoor swimming pool, is made up of 48 apartments in a large chalet-style building with lovely views over the valley and mountains. A sauna or hammam session is also offered per apartment per week. There are many sporting activities nearby including climbing, skiing and hiking. Shop and restaurant 300m. Kitchen area: With electric hob, combi microwave/oven/grill, fridge, dishwasher, coffee machine and tiled floor. Electric heating. Wi-Fi. Balcony. Indoor heated swimming pool (shared, 54m², open Jun-Sep). Smoking permitted.